Developing or reforming legal institutions in postcommunist societies is a long-term priority in any comprehensive reform strategy. At the outset of the transition from communism to capitalism in Eastern Europe more than 14 years ago, reforming the legal system was not the main focus of international donors, non-governmental organizations (NGOs), or reformers inside the transitioning countries. Pressing economic concerns, such as drastically rising inflation, demanded the most urgent attention on the reform agenda. As a certain measure of economic stability, if not prosperity, was restored in the first few years of transition, the focus shifted more toward political and legal reforms. This shift came on the part of the international community as donors realized that a strong legal system—defined in general terms as a system that encompasses comprehensive legislation and the capacity of legal and law enforcement professionals to independently and transparently interpret and enforce the law—was a prerequisite for investment and growth. Sound economic policies were not enough: the best property rights laws served no one if they could not be properly enforced. More generally, establishing the rule of law can create a virtuous circle in which entrepreneurship is encouraged, which in turn helps the economy grow, creates jobs and reduces high levels of poverty and inequality (Linn, 2001). However, implementing reforms that contribute to a strong legal system and thus a virtuous circle in postcommunist societies, has proved, at best, sluggish in many countries. Partly this is because legal reform is a process that takes a long time—laws must be drafted, critiqued, redrafted, read in parliament, approved by parliament, and dispensed to legal professionals. Partly it is because transition countries are coming from a legal tradition that did not embrace such laws, and attorneys, judges, police, and others must be trained on how to actually interpret and implement the new laws. In many cases, the process is slow or halted because proper incentives to reform the legal system are weak or do not exist. This paper aims to briefly discuss the incentives for legal reform that exist in post-communist countries, as well as some of the impediments to such reform. Lessons for a post-communist transition in Cuba will be drawn. For clarity, the discussion is limited to democratic post-communist governments. It is assumed that democratically elected governments have a base level of self-interest in reelection, and will therefore respond to incentives in a different manner than a dictator. Thus a discussion of incentives for legal reform will assume a partly democratic post-communist government in Cuba while acknowledging that this may not be the case in the future (Gonzalez, 2002). In defining incentives, it is necessary to note that pressure from pro-reform actors is itself an incentive in democratic societies, because these actors are also voters. For a self-interested politician, acquiescing to the demands or pressures from voters, whether directly or via groups that represent voters, becomes necessary when his or her position in the government is affected by elections. The base incentive in pursuing legal reforms is thus self-interest; however, this is only compelling when citizens do vote, and consider legal reform among their self-interests as well. Unfortunately, this is not always the case. This is where civil society plays a role. Civil society is defined as the arena in which self-organized groups, movements, and individuals advance their interests relatively autonomously from the state (Linz and Stepan, 1996, p. 7). Intellectual, political, economic, and social organizations, such as trade associations and NGOs, fall into this category, as do journalists and lawyers. As Linz and Stepan (1996) note, civil society as a “normative aspiration and as a style of organization, had great capacity to mobilize the opposition” that was, and continues to be, essential for development in post-transition countries. Civil society groups can often give voice to the concerns and objectives of individuals who alone may be unwilling or unable to fight for their own access to justice, for example, or can draw attention to issues of concern that are too large or opaque for an individual to struggle with alone, such as corruption in the judiciary. Several days later, the Croatian parliament approved the Freedom of Information Act, which incorporated some of the language and provisions of the coalition’s draft. While the case can be made that the Croatian government would have adopted freedom of information laws at some point, with or without the urging of the coalition, a link between the advocacy and public awareness efforts of the coalition and the timing of the reform seems more than coincidental. Croatia’s experience is an example of how pressure from strong civil society groups can act as an incentive for politicians to move forward with reforms. It also illustrates how an issue that is of importance to citizens, but may be too broad or vague for individuals to become involved in advocating for reforms, can be channeled through civil society groups as a method of citizen representation. These groups call attention to the fact that voters do think such reforms are necessary, and will be informed via civil society of what the government has done to advance these reforms. In addition, civil society groups assist individuals in utilizing new legislation borne out of such reforms; TI-Croatia is currently studying regional methods of training citizens on how to file freedom of information requests in anticipation of setting up hotlines and centers across the country. There is a great correlation between the level of freedom in a transition country and the health of civil society. 3 Most of the transition countries in Eastern Europe came out of communism with a great civil society deficit: it was repressed and forced underground, or simply did not exist at all. Countries where civil society was allowed some breathing space, such as Poland, have generally been in the group of countries making the most progress toward free capitalist democracies. In Cuba, civil society is notoriously repressed, likely because the government is aware of the dangers legalizing such groups and associations poses for an authoritarian state. The degree to which civil society thrives underground in Cuba is a leading indicator of how well a post-communist Cuba will fare in having a good system of checks and balances while pursuing reform. Pressure to implement reforms also comes from international organizations as well as foreign governments, businesses, and civil society groups. Often, these tie into economic incentives that come from adhering to international standards, or making progress toward them. While not always quantifiable, general international standards, such as conventions and treaties, act as a pressure mechanism for countries to adhere to a certain set of universally recognized values. The Organization for Economic Cooperation and Development’s (OECD) Convention on Combating Bribery or Foreign Public Officials in International Business Transactions, for example, is an excellent example of how peer pressure can turn a convention into an effective tool. The OECD Working Group on Bribery systematically monitors and promotes the Convention’s implementation, with periodic assessments that force countries to expose their flaws in implementing national legislation to conform to the Convention. Similarly, the OECD’s Anti-Corruption Network for Transition Economies (ACNET), a regional initiative that commits countries in Eurasia and Central Asia to creating or reforming national anti-corruption strategies, including legislation and implementation, uses a peer review process. In addition to international donor representatives, the Steering Group of the ACNET includes civil society representatives of each country. For example, Tajikistan’s progress is reviewed by Tajiks, as well as by members of the international community. This ties into the aforementioned domestic pressure civil society can exert on governments to implement reforms. More quantifiably, international economic incentives work much like sanctions: while they may not impose hardship disallowing financial flows to a country, their absence can exert influence on a government to pursue reforms. The best example of this is European Union membership. Throughout Central Europe, the carrot of eventual EU membership is spurring a wealth or legal reforms from Bulgaria to Croatia. Even countries that may be decades away from joining the EU, such as Montenegro (which will need to become independent from the union of Serbia and Montenegro first), adopt laws that conform to EU standards to help them in their quest. The incentive, beyond the prestige of being part of the “club,” is the access to unfettered trade and cohesion funds available to new member states. In Bulgaria and Romania particularly, with a deadline of 2007 for EU entry looming, some reforms are moving through parliament quickly in an effort to close the legal chapter of the acquis communitaire, the set of standards to which countries must adhere before becoming full-fledged EU members. These economic incentives for accelerating legal reforms are also present in the vast network of international technical assistance, especially concerning governance reform. IMF and World Bank conditionality, once based solely upon a country’s economic performance, now focuses on governance indicators as well, such as the degree of corruption in a country. The catalyst for these institutions to focus on corruption is clear: aid or loans that are funneled to corrupt governments do not reach the people of the country whom they are intended to help through infrastructure development and job creation that leads to growth and higher living standards. Donor governments and international NGOs can also directly funnel assistance to local civil society groups, such as in-country NGOs, but if a government is merely paying lip service to implementing reforms, that assistance will be halted. For example, the U.S. government recently halted all new financial transfers to Serbia until the government makes a significant, good-faith effort to arrest the war criminals that have sought refuge there since the Balkan wars. A final international economic incentive is foreign direct investment (FDI). As with the international financial institutions, international businesses and multinational corporations consider governance and stability a key factor in deciding where to invest. In countries that have made little progress in instituting legal reforms, investment is unattractive for several reasons. First, unclear property rights and requirements for market entry can allow for abuses or rules that are applied unevenly. Second, corruption, whether in the petty form of bribes or the grand form or political corruption, increases the cost of doing business, and thus decreases profit. Reforming laws to make the environment conducive to FDI is a clear incentive for governments to push forward on legal reforms. Given some of the strong incentives for pursuing legal reform, what are some of the reasons why a government would choose to not do so? One answer is the lack of international incentives, such EU membership. This is a rather serious problem for countries in Eurasia and Central Asia, where EU membership is nearly out of the question. While the possibilities of joining the North Atlantic Treaty Organization, the OECD, or the Council of Europe, are still a draw in terms of international prestige, none carries the same amount of economic incentives as EU membership. This is perhaps why many rule of law indicators, such as Freedom House’s Nations in Transit or TI’s Corruptions Perceptions Index, dip negatively as one moves east from Central Europe to Eurasia to Central Asia. Another answer is corruption. The costs and consequences of corruption have been well documented by the World Bank and other organizations; a framework for fighting corruption in a post-Castro Cuba has even been suggested (Pérez-López and Díaz-Briquets, 2002). As a disincentive for implementing legal reforms, corruption reigns strong. Politicians whose salaries are supplemented by groups with an anti-reform agenda, such as corrupt judges who will be sacked if a reform goes through, will be hardpressed to implement reforms. Politicians who use corruption to guarantee their victory in elections will lose the incentive that comes with self-interest of maintaining one’s position. Corruption will continue to act as an obstacle to reform; the only response is to make the incentives available stronger than the corresponding political and economic value corruption holds. Finally, a weak civil society acts as an obstacle to reform because it cannot exert enough pressure to change the government’s incentive structure. This was the case under communism in Eastern Europe: although certain countries such as Poland and the Czech Republic had hints of a strong civil society, it was repressed by the government and forced underground. Often, civil society groups were penetrated by intelligence agents, which further weakened these organizations (Linz and Stepan, 1996, p. 245). In transition, civil society groups have been able to become independent of the state in most cases; however, in continuing dictatorships like Uzbekistan and Turkmenistan, civil society remains weak. The government is not influenced by pressure from civil society to implement reforms and these societies continue to operate much like they did under communism. Unfortunately, there are often limited means through which civil society can be strengthened under such regimes. The potential lessons for Cuba that can be drawn from the examples in Eastern Europe are that a strong civil society will be one of the most significant factors in determining the pace and commitment to legal reforms in a transition environment. This is not to say that the international community will not have a strong influence; in many ways, it has already exerted this influence in trying to bring about peaceful change in Cuba. While membership into the European Union will not be a possibility for Cuba, membership in other organizations, such as the Organization of American States, will carry its own weight and may require a certain amount of legal reforms. Foreign direct investment will also prove influential, and Cuba is currently the recipient of investment from several countries. Ironically, the nature of dictatorship and Cuba’s relative lack of corruption (compared to democratic transition countries in Eastern Europe)4 provides stability for investors. In a transition environment, keeping and increasing this level of investment will act as an incentive to prevent increases in corrupt activity. The opening of the U.S. market to Cuba will also provide incentives for keeping its business environment attractive to U.S. investors. Still, the strength of civil society in Cuba will indicate best the level of incentives self-serving politicians have in pursuing reform. Committed reformers come and go, and given that political will wavers, civil society stakeholders need to be involved from the outset to exert pressure to sustain political will and prove the reform process credible and sustainable (Gonzales de Asis, 2000). Current events, such as the strength of the Varela Project and the recent imprisonment of dissidents, point to the fact that Cuba has a strong civil society forced underground, and that it is repressed by the Castro government for fear of its potential to affect change. If this is true, Cuba may have an advantage in a democratic transition, as Poland did, of having well-organized groups prepared to push for reforms. The United States and other international stakeholders can assist Cuban civil society through the technical assistance tools at its disposal. Once a post-transition democratic regime has been established, donors should begin identifying key civil society groups and provide technical assistance in the form of institution building (which aids in strengthening civil society) and advocacy funds (which allow such groups to raise public awareness about reforms and advocate for change). By nurturing nascent civil society groups early in transition, Cuba can avoid some of the sluggishness that has plagued other efforts at legal reform throughout the transition countries in Eastern Europe and Eurasia. 1. The views expressed here are the author’s and do not necessarily represent those of the American Bar Association or any of its associates or partners. The author would like to note that this is a working draft. Feedback to jgauck@abaceeli.org is appreciated. 2. Information derived from personal observations of the author in official capacity for the American Bar Association’s Central European and Eurasian Law Initiative (ABA/CEELI). 3. 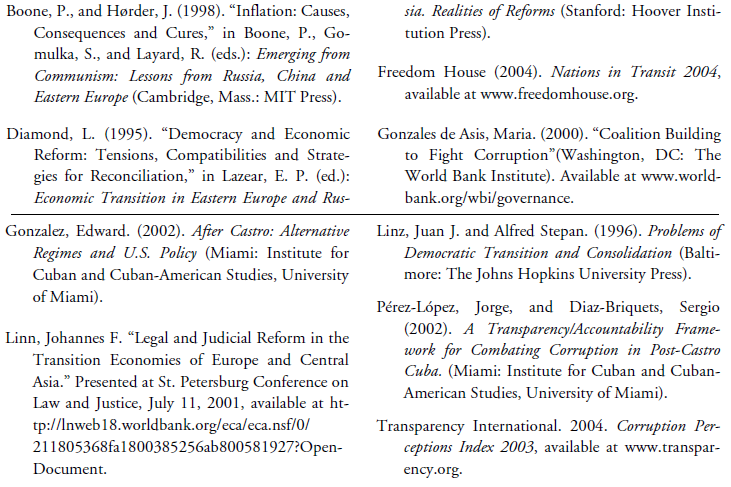 See, for example, Freedom House (2004). 4. See, e.g., Transparency International’s 2003 Corruption Perceptions Index (Transparency International, 2004).